The COBB Intake for the Focus ST takes a great airbox design and makes it even better! COBB improved upon the factory airbox ram air ducting to increase airflow and to hear that great turbo sound. The constrained piping to the turbo is replaced with 3" mandrel bent aluminum tubing to maximize air flow while custom silicone couplers ensure a perfect OEM-like fitment. You can also proudly display your fine taste in performance modifications with COBB's graphics for the intake tubing. The COBB Intake is the perfect first step towards Stage 2 power levels when paired with the COBB FMIC! 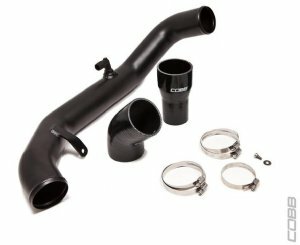 "COBB cold air intake review"
Comments: A great choice for anybody looking to upgrade their intake system. Noticeably instant response in throttle. A little tight install but very doable. Install should only take about 2 hours.